Part of the wonder of Bill Jacobson’s lucid, affecting retrospective at Robert Klein Gallery and its satellite space at Ars Libri is how did the photographer ever get from there to here? His out-of-focus early works of the late 1980s and the 1990s have the gauzy quality of memories — deeply felt, yet hardly fixed. Black-and-white portraits, such as “Song of Sentient Beings #280,” a blurry, fading image of a man with his head bowed, immediately bring to mind the art world’s plaintive response to the AIDS crisis. Yet they do not feel dated: Mortality and the ache of loss are perennial. In the mid-2000s, Jacobson’s photos came into keen focus. Edges, once foggy, grew precise. Perhaps he was seeking clarity. Edges define moments, shape compositions, and set limits. Two bodies of work, “Place (Series)” and “Lines in My Eyes,” often revolve around rectangular panels. 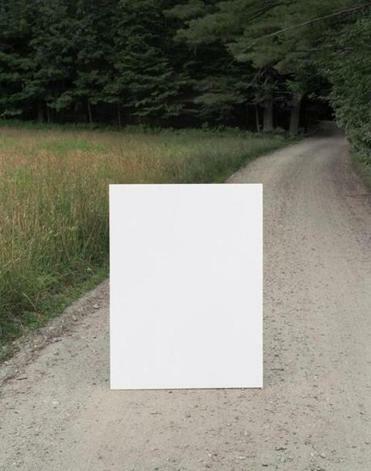 In “Place (Series) #240” Jacobson has propped a white panel — think of a painter’s untouched canvas, a writer’s blank page — on a dirt road. The panel’s clean edges cut through the natural scene. Other edges — the diagonal of the road, the horizon — are not as hard. White flatness pops right out of the middle of a bucolic picture of depth, breaking up and indeed shaping nature with artifice — which is an artist’s prerogative. In the terrific “Some Planes” series, instead of pitting formal abstraction against nature, Jacobson delightfully marries them. “Some Planes #601” captures a white sky over a tilting horizon, with a dark desert sloping below. Textures in the sand give the game away, but only after the first take — that this is a lean geometric abstraction. Jacobson’s work of the last decade may not have the sentiment of his earlier images. Instead, they have sly humor. All his photographs display his astute curiosity about how the tools of picture-making — focusing, framing, tonality — influence our perceptions and shape our understanding. In or out of focus, this artist’s images push back at us, questioning our assumptions, and pushing at our bruises. Like Jacobson, painter Jaqueline Cedar counters elements that tether us to reality and the human experience with the weird, formal world of the flat picture. In her show at Steven Zevitas Gallery, Cedar collages roughly drawn figures cut from canvas onto grounds of lush fabric. The paper-doll-like figures appear to have some agency. They spark narratives. And, as in life, their environment often squelches or betrays them. “But how” looks benign enough: A couple strolls beneath a full moon. The crushed velvet background dazzles: a gold and fuchsia sky above the horizon, a woozy field of blue, brown, and white below, which I took for water. Cedar adds a second bottom edge to the scene with a strip of canvas. It crosses behind the ankles of the couple, then drops disturbingly toward the floor. Where Jacobson revels in edges, Cedar deliberately messes with them. That small gesture of a plummeting border dooms everything, threatening all order. The figures also drop off the bottom of the picture; indeed, they have no feet. Things are even worse in “All kinds.” Two guys face off on a succulent orange ground. The fellow on the left has the power: He frowns; he stands in a corner drawn with paint. Behind him, painted lines echo and reinforce his stance. His blanker-faced adversary doesn’t have the painterly illusion of space to prop him up. Rather, it acts against him. The poor guy’s feet have been cut off at the ankles by the line where floor meets wall, and they drift away. Cedar’s constructed spaces are fictions. She can do anything she wants with them. But we identify with the figures; because they look like us, they feel like ours. When Cedar’s space is in disarray, the figures suffer. Or that’s our projection. It’s all her fiction, of course. Cedar finds the tension between figuration and abstraction in her viewers’ allegiances and expectations, and cranks it up. “The Essential Herman Maril” at ACME Fine Art proves a tonic. Maril, who died in 1986, was a painter of landscapes and still lifes who weathered the torrent of abstraction that dominated mid-20th-century painting. His canvases read like brief, limpid poems. They do tune to abstraction, especially when it comes to composition. The show leaps through decades, from the 1930s to the 1980s; we can witness the artist mature. “Skaters,” from 1947, depicts a pale, dagger-shaped pond in a jagged, hilly landscape, all drawn with heavy contours. Lines zigzag, pulling the eye. Three skaters dart across the pond. It’s heavy-handed, vaguely ominous, pushing a story.